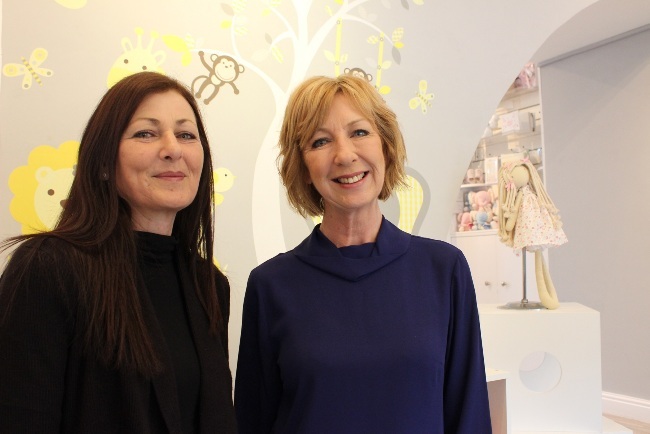 It was something they dreamed of when they were young, and now two sisters from Huddersfield have fulfilled their lifelong ambition and launched a baby boutique together. Linda Holmes-Phayer and Gayle Phayer-Thompson have just finished an intensive three-week refurbishment of their 500sqft space on Westbourne Road, Marsh. And now, only 1 mile away from where they grew up in Salendine Nook, Luna’s has opened its doors to the public. Selling 0-2 year-old clothing, gifts and baby shower accessories, the two-storey boutique stocks high quality yet affordable products that the sisters felt were lacking from the high street. So Linda hung up her scissors after 40 years as a hairdresser and Gayle completed her final shift in a senior role at nearby The Oakes Care Centre, to make their childhood dream a reality. £16,000 of investment later, all eyes are on the future of their new venture. The pitter patter of tiny feet has continually brought the idea to the fore over the decades, particularly when Gayle had her two children Eleanor and James – now 20 and 19. “For years we’ve talked about the limited choice on the high street, especially when compared to wider Europe,” she said. Linda, who has three young granddaughters and a grandson on the way, continued: “There are some amazing brands out there, that design incredibly beautiful outfits. But the more unusual clothing is often more expensive. The co-founders have decorated the premises from top to bottom – complete with new branding courtesy of FASTSIGNS Huddersfield. Expansion is already on the cards, with the upper floor set to be renovated in the not-so-distant future and sizes to span from 0-6 years old when further suppliers can be found.